Our last day in London. After filling up on breakfast we made our way to the Science Museum. We spent the morning in the Wonderlab having a go at lots of different experiments. Then we went to a maths workshop where we had to solve problems to unlock Mr Bracha and learnt how maths is used in every day situations. After lunch we visited the Imperial War Museum to learn more about World War 2. We saw lots of original artefacts including a Spitfire, a Lancaster bomber and artillery that was used during the war. Had a jam packed day today. First we visited the Queen at Buckingham Palace and watched the guards change over. Next we visited the HMS Belfast, which played a crucial role in liberating France during the Second World War. We even had a go at sending messages by morse code, just like they did during the war. After a windy lunch with a beautiful view down the River Thames we made our way to the London Eye.Lots of us conquered our fears, we took some amazing pictures of the city and spotted many famous landmarks. This was definitely a highlight of the trip! To finish the day we had dinner in the rainforest (The Rainforest Cafe). We saw lots of cool animals and were sometimes treated to a thunder storm! We've had a fabulous first day! After a long journey down to London we arrived at the Natural History Museum. We explored the museum after a quick spot of lunch in the courtyard. We saw real dinosaur bones, fossils and the famous replica of a blue whale. It was amazing! Afterwards we stopped off at our hotel, had some dinner and went to watch The School of Rock Musical! It was incredible, we were all jamming away in the audience. This week we took part in another drama session with Pavla. We became Countryside children and had to imagine what it was like hosting an evacuee. We created lots of freeze frames, thought tracked different characters' feelings and also did some hot seating. It was all very exciting! Next week, we will transform back into our countryside host character and write a letter to one of our friends explaining about our new evacuee. Just a little reminder this term P.E is on a Tuesday and a Friday, as we now have the Leeds Rhino Coach! Year 5 had a fantastic time at Eden Camp last week. In the bunkers we saw a puppet show, walked through a street that had been affected by the Blitz, went in U-boat and saw lots more exciting things. We learnt lots of great facts about WW2, and can give detailed answers to some of our research questions! This term we have been extremely busy! We visited Armley Mills last week, which is an old Victorian Mill in Kirkstall. We were transformed in Victorian mill children, learnt about all the horrible, dangerous jobs that children as young as 6 we forced to do Imagine having to work for 12 hours every day! After lunch, we went into a Victorian schoolhouse. We used slate boards and slate pens to complete some Maths tasks. We even used ink well and dip pens to complete a handwriting task. Our school teacher was very strict (almost as strict as Mr Bracha!) and showed us of the punishments we would have received if we didn't do as we were told. It was terrifying! Besides this we have also seen the Nutcracker at Leeds Grand theatre. We are also preparing for our Christmas production, we can't wait for you all to see it! We have had a really busy week this week. We have been on two school trip! On our first trip, we learned about different cultures. 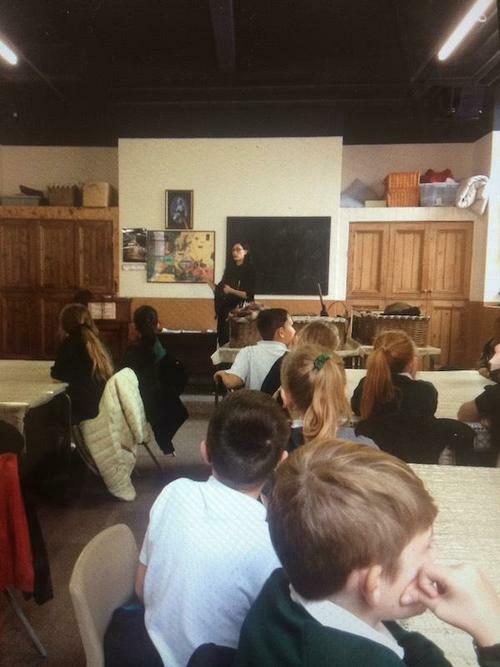 This included a tour around a mosque, a workshop with a professional beatboxed, learnt a traditional South Africa song and created exchanged friendship bracelets with other schools. On Thursday we went to the Moyles Centre to support our class debating team. The children worked extremely hard and represented the school fantastically well. In class 12, Maddox won the best speaker award and Class 11 won their debate. Well done everybody involved! We had a great time at the Thackrey museum, learning all about Victorian Leeds. We even went into a Victorian school room and learnt about real people, who lived in the poorest area is Leeds. Had a really exciting week. We have had our first session with Therese practising our debating skills. We have completed completed a fitness test and are now trying our best to complete a daily mile! Wish us luck!